This second kind of gold story not only bends the facts, but breaks them in an attempt to manipulate the investing public into not buying, holding precious metals, and even attempts to convince them to short PM's. The opening quote is taken from one such piece just published by Investopedia. As the title implies the story starts off questioning golds ability to act as a safe haven. This while gold is currently acting as an effective safe haven, go figure. Since the Fed raised rates in mid-December the S&P 500 has fallen over 8%, while gold is up 16%, nearly all on a safe haven bid. Considering this, its pretty ballsy to title a story "Is Gold a Safe Haven." I'll address additional quotes from the story that will be in italics as we continue. 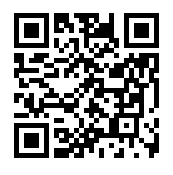 "On a larger scale, we're slowly but surely moving toward a cashless society. 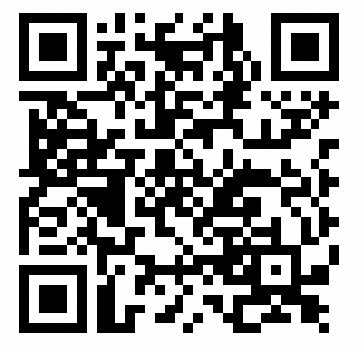 If we're not going to use paper money because it's seen as an outdated form of trade, then moving to gold would be archaic. Everything will eventually move digital." When Nixon removed the dollars convertibility into gold, many economists forecasted that the price of gold would drop. To anyone who didn't understand gold it would make sense; if there was less demand for gold as a monetary base, the price could possibly go down. 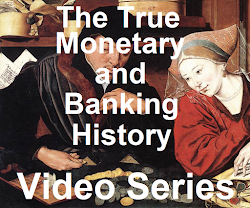 We now clearly know that this was not the case, and though gold was no longer an official monetary metal, it did not change the fact that it was a monetary metal, and a premier store of value. If the role of gold was not diminished from the government declaring that it wasn't money, do you think it will be changed when they declare that paper isn't money either? Also let's not forget that the only reason economists want to ban cash is to implement negative rates to save the current monetary system. Physical gold may not pay a dividend, but at least it doesn't charge one, thus negative rates should be excellent for gold. And again negative rates are ONLY to save a FAILING system! "Jeffrey Currie, global head of commodities at Goldman Sachs Group, Inc...has a three-month target of $1,100 an ounce and a 12-month target of $1,000 an ounce." 5 of the 6 top Goldman Sachs trades of 2016 have already failed. Anyone paying attention to Goldman's calls should by now understand they are made to "fleece the muppets" aka, the investment bank is making the call only to take the opposite side of the trade against clients or anyone else willing to take their advice. Not only would I take their suggestions with a grain of salt, I would take them as a contrarian indicator. "Today, that's not the case. If and when deflation hits, the Fed might come to the rescue by moving interest rates lower or even by implementing negative interest rates, but there's still not many places to go compared to 2008. Any inflationary spikes will be short lived, which means any gold rallies will not be sustainable." I'm not sure what makes Mr. Moskowitz think that the Fed will not be able to stoke inflation. The Fed has never allowed a significant period of deflation since the Great Depression, and it is laughable to say that the Fed is out of bullets, as explained here. The Fed has many avenues to continue to create money from nothing including restarting QE, so called helicopter money, and yes, negative rates. "The only real catalysts for gold are panic/confusion in the stock market and the Federal Reserve turning dovish. While both catalysts have the potential to lead to large short-term gains, neither will lead to sustainable gains. It's a lose/lose for gold. If the global economy is entering a deflationary cycle, then gold will take a significant hit. 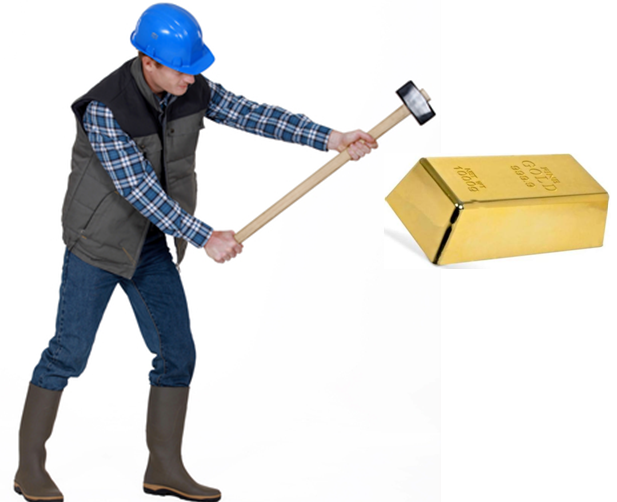 If the global economy is improving, the Fed will tighten and gold will take a significant hit." 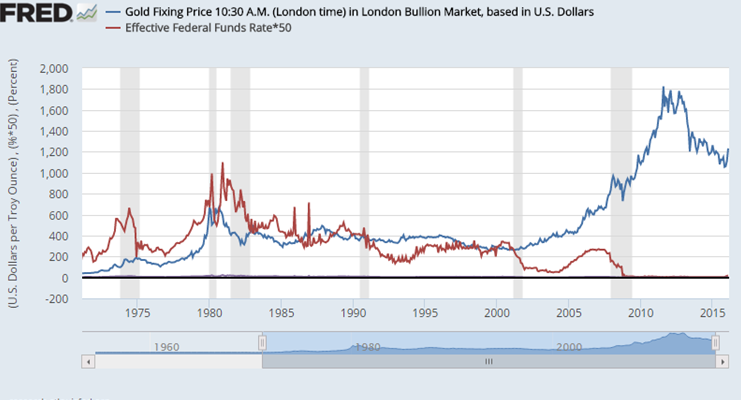 First, to address his assertion that gold does not perform well in a deflation. Where is he getting his evidence of what he almost states as common knowledge 'fact'? There is only one instance of sustained deflation during the Federal Reserves reign, the Great Depression. What happened to gold prices during this time you ask (and Mr. Moskowitz should have asked)? It increased from $20.67 an ounce to $35 an ounce. A 70% return during a time when stocks and real estate were looking at even greater losses. His second assertion is if the economy improves, the Fed will raise rates and rising rates will be bad for gold prices. Again, I would have loved if he would have provided some data points, but since he didn't, I will. 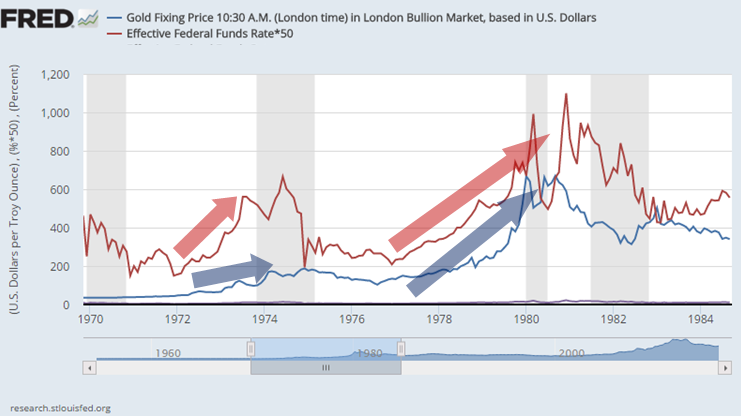 Here is a chart showing the bull run in gold during the 1970's. While interest rates were rising from 1972 to 1974, so to were gold prices, and actually when the Fed Funds Rate fell the gold price did as well. The upward trend in Gold prices continued when interest rates again started to rise. 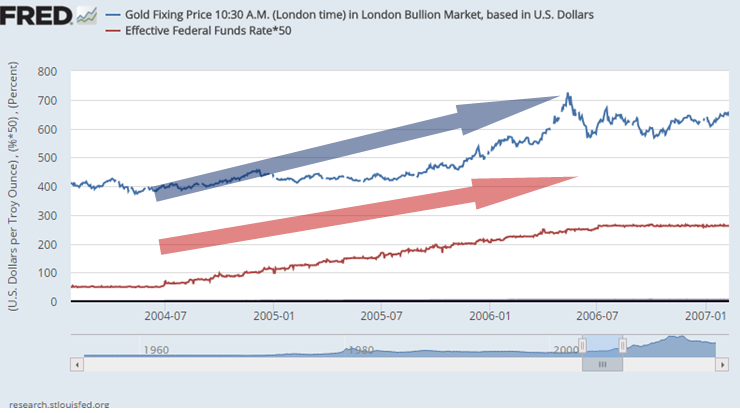 During the interest rate increase cycle of the early 2000's we again saw gold price rise. And what did the Fed do a couple months ago? Raise rates. What has happened to gold prices? Frankly, when looking at the below chart of interest rates and gold prices, when Mr. Moskowitz's says "If the global economy is improving, the Fed will tighten and gold will take a significant hit" I don't know what the heck he is talking about. Falling interest rate can appear to be good for gold as was the case in 2007-2011, but my point is there isn't a concrete correlation. After taking just a few moments to look into Mr. Moskowitz persuasion points it is clear that he is not presenting even remotely factual information. This story is not providing facts that support a view point, it is providing counterfactual propaganda that the author wants to believe or wants the reader to believe. I hope his DUST gold short position wasn't opened on margin.